Blog //What Could Make Ivanhoe 'Special'? Last semester was not bad for our Praxis team. Our achievements were modest but considerable: a charter, a team with a common interest in any activity concerning food, plus a vibrant debate on redesigning the website for our common project - Ivanhoe. While we failed in meeting certain deadlines and charter objectives, i.e. having tangible visible results, I want to emphasize how productive the process has been for us in my view. We had an exemplary meeting as a team to decide on a tagline for Ivanhoe. It was a successful meeting because we had a limited amount of time, a very specific well-defined task and an agreed process of making decisions. The most significant element of this meeting for me was free brainstorming and discussion of the logic behind our preferences and choice of words. The task in front of us seemed small -what is a tagline after all: put five-six words together and you’re done. But we did not underestimate the importance of this task. We considered carefully each and every word of the tagline, making sure that it reflected the ideas that gave rise to Ivanhoe at the first place as well as our vision as a team about its future. Look at our notepad! Within an hour of conversation, we decided to call Ivanhoe: ‘A Gateway to Collaborative Textual Play’. The key concepts we built this phrase on were: fluidity, interpretation, reflection, performativity, and collaboration. Our tagline draws a vision of Ivanhoe not just as a space with pre-established boundaries - a platform or a place of some kind - but a space that enables the emergence of boundaries, actors and places through play. That is why we chose the term ‘gateway’ and followed it with the preposition ‘to’: to indicate its initial purpose as an enabling environment for learning. 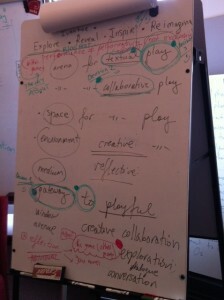 As Jeniffer’s last post seems to conclude, Ivanhoe can enable learning through play. In the current version, Ivanhoe enables learning through the ‘role’ and ‘role journal’ features. These features require players to reflect on their moves/interpretations - before and after they complete them. While I agree that Ivanhoe is a learning environment, I want to argue that this is not enough to define it and that we need to specify further the kind of learning this environment enables that other environments do not. The existing version of Ivanhoe seems to emphasize one kind of learning - learning that results from reflection on one’s individual actions and thoughts. One might argue that this kind of learning through such self-reflection can happen everywhere and does not need a facilitating enabling environment like Ivanhoe. For example, commenting to a Facebook status or a WordPress blogpost also requires self-reflection - you have to think about yourself, your words and interpretation of a particular text - a photo, or music video, or quote from somebody’s book, etc. This is similar to what you can do in Ivanhoe. I want to suggest that one way to make Ivanhoe ‘special’ i.e. to define its use as a learning environment, could be to create a feature that makes it enable another kind of learning - learning from others through reflection on the trajectory of play and the relationships among players’ interpretations. This feature could be incorporated within the existing ‘role’ and ‘role journal’ features. It would require players not only to reflect on their own individual moves before and during play, but also to reflect on the moves of others and the way in which the relationships between players’ moves shape the process of play and its end-result - an ‘Ivanhoe game’. The aim of such feature in Ivanhoe would be to enable a kind of learning that is difficult to achieve in other environments - WordPress, Facebook, a museum, or even a classroom: learning about others and how one’s interactions with others shape cultural objects or texts of common interest. This kind of learning could be achieved by requiring reflection in a journal - before, during and/or after play - about the set of relationships that contribute to the emergence of the text of common interest and define its form. I argue that Ivanhoe can become special if it is able to promote reflection about other players’ interpretations of a text and the interaction between interpretations that give a particular form to that text. I am looking forward to our team’s discussion of this option and the implementation of such idea into a well-designed Ivanhoe feature. We have a tagline and we agreed that for us it is not just a statement about what Ivanhoe does in its current state, but more of an expression of our aspirations about what Ivanhoe can do. The conversation that led to the tagline creation helped us as a team consolidate our ideas about Ivanhoe and what we wanted it to be. However, we need to continue the debate on what Ivanhoe does and what can make it special as it will shape our future work this spring semester. I hope that the time we take learning new skills- html, css, php, etc.- will not be seen separate from the time we give to talking and reaching an agreement about the use and purpose of Ivanhoe - or how to make it special. I am looking foreword to more successful meetings this new year. Cite this post: Joris Gjata. “What Could Make Ivanhoe 'Special'? ”. Published January 31, 2015. https://scholarslab.lib.virginia.edu/blog/what-could-make-ivanhoe-special/. Accessed on .